All Is Well spends two hours desperately tickling the audience but the overall impact is one of torture, says Raja Sen. There is some strange correlation between director Umesh Shukla and the letters P and K.
After his successful satire OMG: Oh My God pointedly mocked godmen and blind faith, a film called PK came along that did the same thing less scathingly. Now, a few months after Piku regaled us while giving us a treatise on the importance and inevitability of caring for the elderly, here comes Shukla's newest, which also features a disgruntled kid and a father with bladder issues. But despite having the right intentions -- and a Bachchan in his cast -- Shukla's new film shouldn't even be mentioned in the same breath. There's nothing wrong with broad comedy. There's nothing wrong with cartoonish characters. There's nothing wrong with preposterous, senseless situations. The only requirement is that the film make you laugh. All Is Well spends two hours desperately tickling the audience but the overall impact is one of torture. I didn't laugh a single time. In the row ahead of me, a father chastised his daughters for bringing him along to this bilge. They giggled apologetically and wondered why anyone would make something like this. Meanwhile back near Chandigarh, Bhalla Sr, played by Rishi Kapoor, runs a bakery. In case this slips your mind, he uses the word 'bakery' in every sentence. The father and son are estranged and, for the first 40 minutes of the film, we just see Kapoor and Bachchan scowl while the background score explodes with random guitar strumming and whoa-ho-ho wailing. The women in their lives lead a tragically thankless existence. There's Asin, a devotee of Rhonda Byrne's book The Secret, who pursues Abhishek Bachchan with a Big Ethel doggedness, constantly asking him to come be her man. His reaction to that? "Goodbye, Miss Nimmi," with the "MISS" emphasised rather brutally, as if he doesn't believe she ever will, or should, be married. Meanwhile, Kapoor is married to Supriya Pathak, who has Alzheimer's. It's a convenient malady for an actor to have in a project written made with such clumsy thoughtlessness, and Pathak, a powerful and evocative actress, stumbles around looking blank while presumably cursing her luck for a film like this. Those tears must be real. Shukla, as a director, tries far too hard, taking good actors and forcing them into hammy performances. The sharp Mohammad Zeeshan Ayub, for example, is here cast as a bumbling villain. He tries his best, but there's only so much you can do when the filmmaker's idea of flavour is to have everyone keep saying "paihe" instead of "paise" to show that the film is set in Punjab. This over-reliance on flavour means odd dialogue, with girls talking about cute boys and how they just want to eat 'em up "like rajma chawal." There is even a sudden item song where the robust Sonakshi Sinha mouths words like Main nacha parathe kha ke. Easy to believe, certainly, but hard indeed to comprehend. Near the end of the film, all the relentless running around is stopped and Kapoor and Bachchan finally talk things out, both actors hitting the right notes during the dramatic dialogue and actually making the moment work, giving this painful film a sceneful of sincerity. But by then, it's far too late. At one point in All Is Well, Bachchan picks up Rishi Kapoor and carries him on his shoulders. This is the big 'moment' of the film, clearly, the Shravan Kumar moment which shows the prodigal son lifting the father. 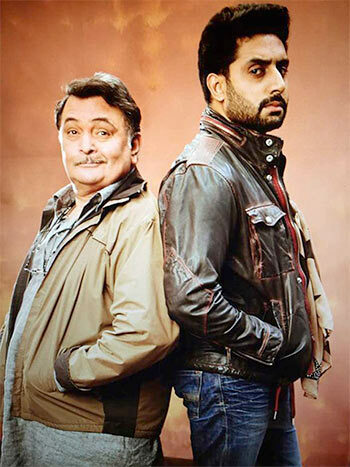 It is, however, a slow-motion mess, which is made further farcical by Rishi Kapoor, while hanging from Bachchan's left shoulder, trying to pat the younger actor's back a few times. It's a tell-tale gesture; This isn't encouragement, it's a fine actor giving up on a bad film. Rishi Kapoor's tapping out.